Brett Howell is attending PERC’s Enviropreneur Institute program taking place in the Bozeman, Montana area from June 25th to July 8th. Below we are posting some time-delayed blogs that Brett wrote while at Ted Turner’s remote Flying D Ranch. In addition to reading Brett’s blogs, follow his tweets @BrettWHowell and @gaiaendeavors. I’m sitting by a stream at Ted Turner’s Flying D Ranch as I ponder my first experiences with the Property and Environment Research Center (PERC) Enviropreneur Institute (known as PEI). I’ve been in Montana since Sunday, June 25th for PEI. We have an incredibly diverse group from across the US, Israel, the Galapagos, and South Africa. Each of us was selected through a highly competitive application process so that we could gain hands-on training in free-market environmentalism (FME). PERC’s version of FME is “dedicated to improving environmental quality through property rights and markets,” focusing on the creation of property rights to make markets work so that entrepreneurs can step in to solve environmental challenges. On Monday, June 27th, we drove approximately 45 minutes from Bozeman to The Flying D Ranch, a 116,000 acre property that Ted Turner purchased 20 years ago. We are staying in rustic cabins alongside a small creek. From here we can see snow-covered peaks, beautiful green rolling hills, and perhaps most stunning, thousands of buffalo (also called bison). This morning we heard from Danny Johnson, the Flying D’s ranch manger. 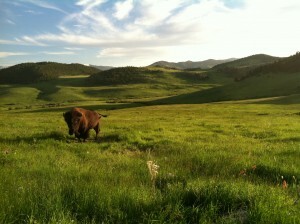 I now know more about bison farming than I ever thought possible. Ted Turner, a name originally synonymous with CNN, is well known in Montana and throughout the US for his bison herds. He owns more than 54,000 head of bison throughout the US, approximately 5,600 of which are somewhere on the ranch where I’m currently sitting. Bison meat prices dropped in the mid 90s. To help create a market and drive demand, Ted’s Montana Grill was created to help introduce people to bison meat and provide a distribution channel through which his Turner’s meat could be sold. Along with being a media entrepreneur and rancher, Turner is a committed conservationist. He controls more land holdings than the total size of Yellowstone National Park, and he has committed to putting conservation easements on every property he owns so that the natural state can be protected in perpetuity. Turner also supports a pack of 25 wolves (18 adults, 7 pups) that moved onto Flying D Ranch recently despite significant impacts on ranch operations. Turner’s decision to maintain wolves on his property is in sharp contrast to the wolf debate raging on public lands where farmers, hunters, environmentalists, and the park service, among others, are deliberating about the predators’ future in Montana. The decision to allow wolves on the property has a clear impact on Flying D’s bottom line. For example, approximately 30 bison have been killed by wolves so far this year at Flying D Ranch, despite the fact that the wolves primarily feast on elk. Each bull bison sells for approximately $2,300. Elk hunting costs $14,500 for four and half days on Flying D Ranch. Given wolf impact on elk populations, the number of permitted elk hunters is being reduced to 24 from 30 for the upcoming season. Flying D has also hired a full-time wolf biologist to keep an eye on the pack. The experience at Flying D Ranch has been an incredible opportunity to get out of the city and really connect with fellow PEI participants and see a model of FME at work. Our discussions are wide-ranging and truly inspiring! If you put a price on something, at what point are social norms holding us back from a market? Do fish have rights (e.g. under the US Endangered Species Act)? Is a product that accounts for the cost of production externalities (e.g. polluting a stream) really a luxury good vs. the same product that is priced to ignore such externality costs? The PEI Fellows woke up at 4:45am on Wednesday, June 29th, for an early morning tour of the Flying D Ranch. In three hours we had the incredible opportunity to see bear, moose, bald eagle, golden eagle, elk, white tail deer, coyote, beaver, and of course, farmed buffalo. At almost three times the size of my current home, the District of Columbia, the 116,000 acre ranch is a vast expanse that we barely began to explore on our drive. I have always dreamed of SCUBA diving the Galapagos, a biologically diverse set of islands off the coast of Ecuador. The Galapagos became famous because of explorer and biologist Charles Darwin. I have read numerous articles about the islands, but I have not yet had the opportunity to visit them. A highly informative conversation with PEI Fellow Jorge Ramirez provided insights about his experience working with World Wildlife Fund (WWF) in the Galapagos. Some key points from the discussion are below. Approximately 20,000 people live on the Galapagos. While there are four villages, one consists of only 200 people, so there are really only three main population centers on the island. 400 people make their living through fishing. The three most important fisheries are sea cucumber, lobster and bony fish. Sea cucumber and lobster have both been overfished and are now degraded. Tuna and wahoo are also fished, but are less significant. All other marine species are protected through the Galapagos Marine Protected Area (MPA). Sea cucumbers are cooked into a sandwich-like patty which is sold for human consumption in Asia. Lobsters are eaten on the island and also exported. Ten years ago a co-management scheme was put in place with fishing sector, tourism, science government and NGOs to develop a fisheries restoration plan. Since that time fisheries have degraded further, rather than recovering. Locals and government now want the government to take back exclusive control. There are too many fishermen, but because of the close-knit community, no one wants to tell the other that they can no longer fish. Attempts to convert fishermen to tourism operators have failed because there are no more tourism operational licenses, and fishermen want to be just that, fishermen. Solutions, such as paying fishermen not to fish (an approach used elsewhere in the world to reduce fishing pressure) would likely not work because fishermen do not understand that such payments would be made with the intent of teaching them a new skill instead of a long-term handout. Ecuador recently created a new constitution, which recognizes the rights of nature, called “Pachamama.” This is a first-ever recognition anywhere in the world that nature has tangible rights. Now, it is important to help Ecuador figure out how to create the rules that will implement these rights. Currently, justices do not have the necessary knowledge to be effective (e.g. the difference between a shark and a ray). Sea Shepherd Conservation Society and other NGOs are helping to educate Ecuadorian justices about how to implement the new structure. Any Ecuadorian can claim that a company has violated the rules of nature. This creates the opportunity for unlimited claimants with uncertain rules. Read more from Brett Howell at Gaia Endeavors.